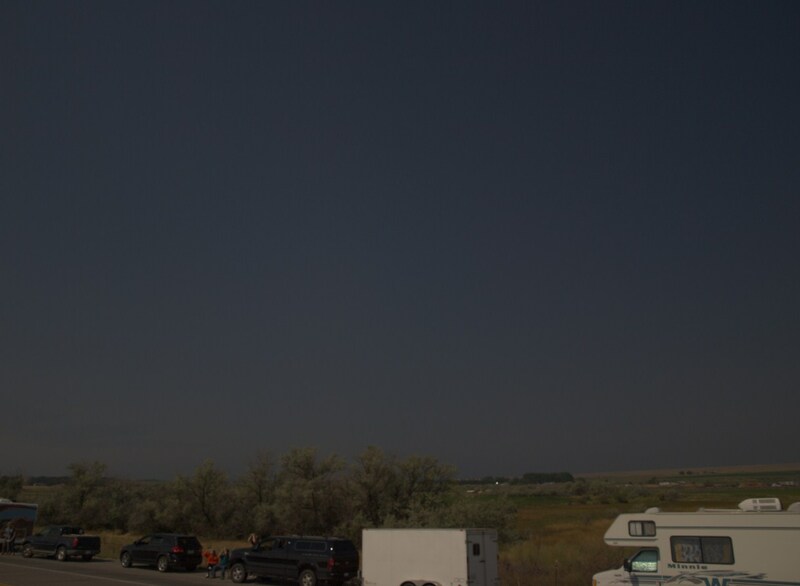 Total solar eclipse 2017 seen near Soshoni in Wyoming. Today is exactly 1 year after my one of the biggest dreams came through. My body and soul was located inside the lunar shadow for the first time! I can admit, that I dreamt about it since 11.08.1999, last deep partial solar eclipse seen from Poland. I will not come back to that moment, because this is a long story. Maybe I will describe it in the future, however I was watching that eclipse from home, so it was not a eclipse chasing itself. Anyway I was fortunate to witness almost the same eclipse after exactly 1 saros. Saros is the period of 18 years, 11 days and 8 hours, that is used to predict the solar and lunar eclipses. The 2017 21st August the Earth, Moon and Sun returned to approximately the same relative geometry. 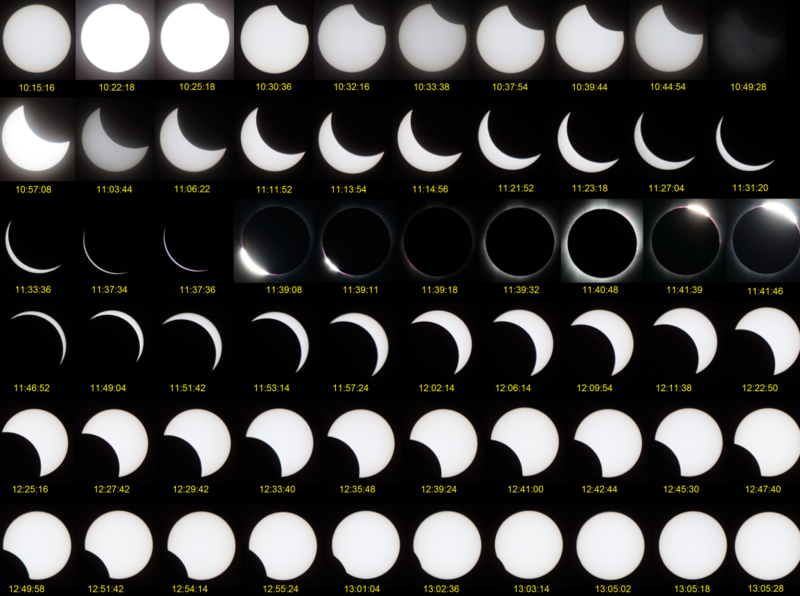 In the result a nearly identical eclipse occured comparing to 1999. 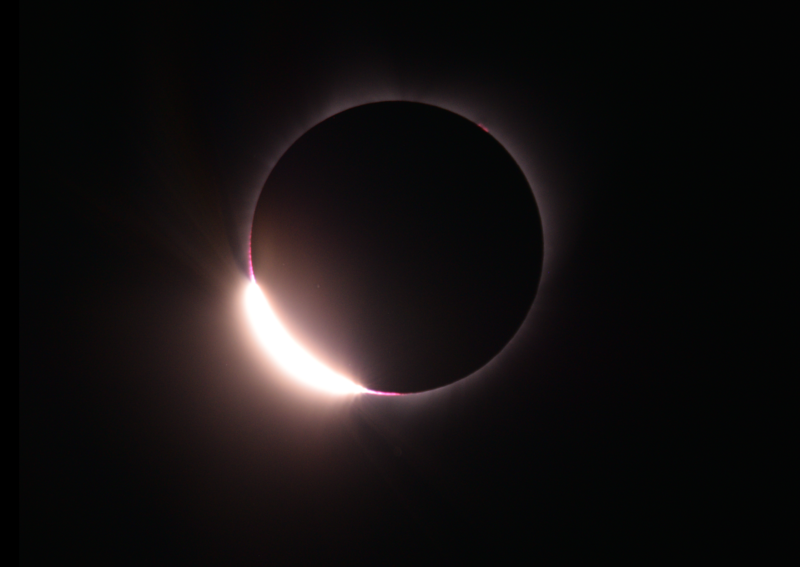 The 1999 August 11th greatest eclipse lasted 2m 23s in western Romania, the Greatest American Eclipse was 18 seconds longer. This time I was a member of the Great American Expedition of Polish Society of Amateur Astronomers, which lasted around two and half week. This fascinating journey was also the longest journey in my life in that moment. Everything was great, too great to squeeze up in this article. I will back to this great journey from time to time when describe the picture-perfect spots and national parks across the western US. 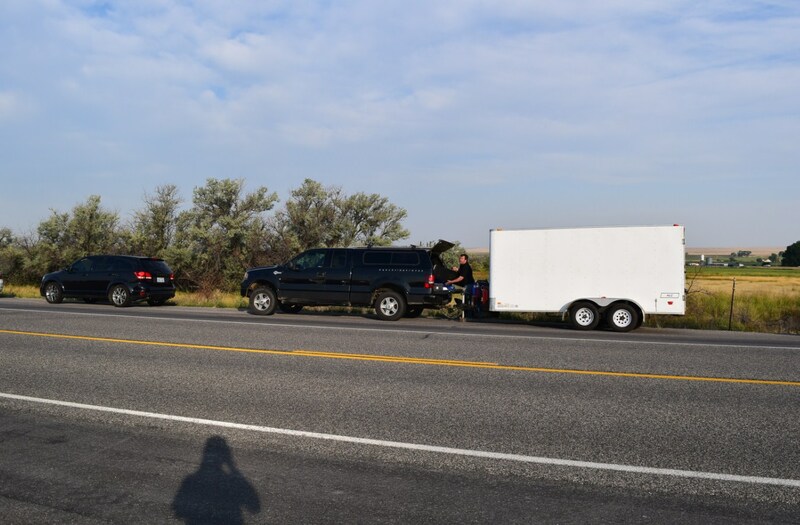 Now I would like to enclose the 1,5 day of our Great Expedition – the eclipse day and the afternoon before, when we came to our hotel Oak Tree Inn in Green River. Well, we arrived to Green River in early afternoon hours. After lunch our team lead Marek Substyk gathered us in order to plan next forthcoming day, a pivotal day our Great American Expedition. We were issued with important advises how do deal just in case of potential bad weather o huge traffic. After the reunion everyone went to his own room and started to pack the gear or test the equipment. Sun was out again around 6pm after thunderstorm. Pic. 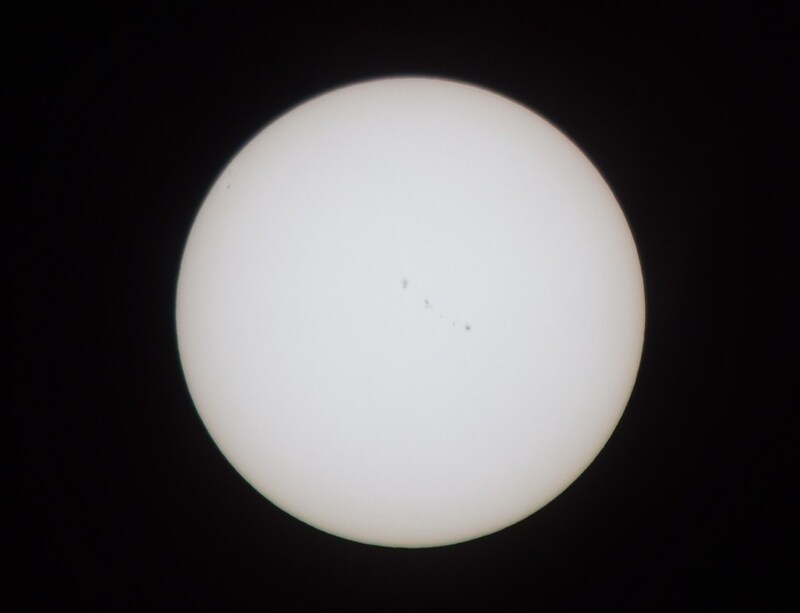 1 The solar disk (with sunspots no2671) on August 20th Sunday’s evening, 300mm, 1/640s f/5.6 ISO 100/ Baader 5.0 filter. When we checked our equipment we went sleep for a few hours. Well, we divided on 2 groups, where 1st departed at 1:00 am and another at 5:00 am. I was in the first group, the group of professional stargazers: Bartosz Wojczynski and Piotr Dzikowski, who wanted to capture rising Orion and another constellations of winter sky. We were also worried about the parking space. Pic. 2 Our departure at 1:00am from Green River village. We set at 1:00 then, to reach our eclipse watching place located around 270 km ahead. We came there at 4:20 where spent next few minutes to find a proper car park. The first one appeared to be nice, however the electric lines could interfere the observation. Pic. 3 One of my colleagues testing the equipment on site before crack of dawn. Next one was better but I disagreed it due to high vegetation on the western side. 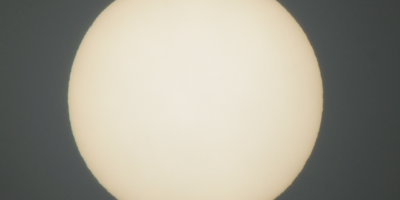 We back maybe around 1 km then to the biggest one, which featured possibly clear view on the Sun. Unfortunately the vegetation still coveted the western part of the horizon with Lost Wells Butte 1734 m.a.s.l., a peak where 2nd contact should occur 16 sec earlier and the remote Wind River Range located on the lunar shadow diameter distance (around 110 km). Well, force majeure. As it worst? Outside the parking bays the view on west was clear (sic!). Once we decided, that this parking is good (we have to make right decision, due to increasing traffic and further shortage of space) Bartosz Wojczyński, Tomasz Rać and Piotr Dzikowski set their equipment immediately and started to conduct professional observation. There were 2 cars only, so mates have enough space to unfold their observation gear. 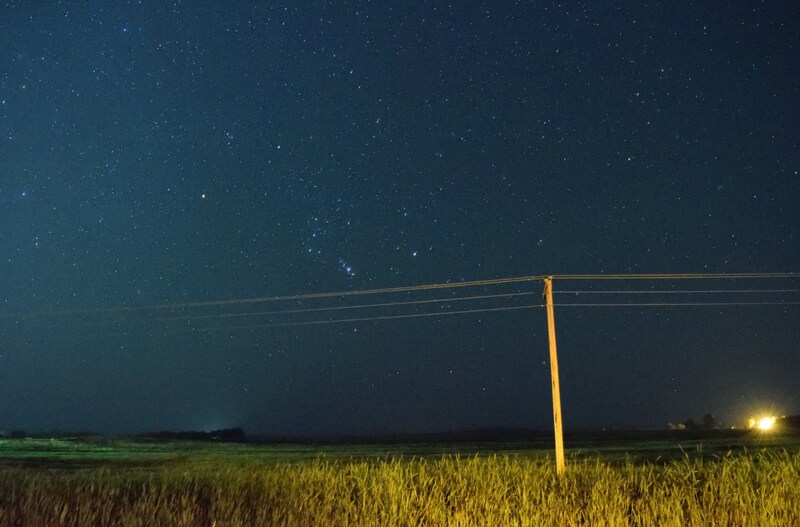 I took a few pictures of the night sky around Riverton, and after this decided to take nap in the car. Pic. 4 The Lost Wells Butte, 1734m.a.s.l (around 250m.a.g.l) located around 14km in the byline, where 2nd contact occured 16s earlier than from our eclipse observation place. This butte was seen just outside the parking bay. Pic. 5 The Venus rise above the Riverton environs, The Gemini constellation with Pollux and Castor seen above Venus; 20mm, 20s, f/5.6, ISO 12800, 4:23 UTC-7. Pic. 6 The Orion Constellation rising above the Riverton environs; 20mm, 20s, f/5.6, ISO 12800, 4:25 UTC-7. 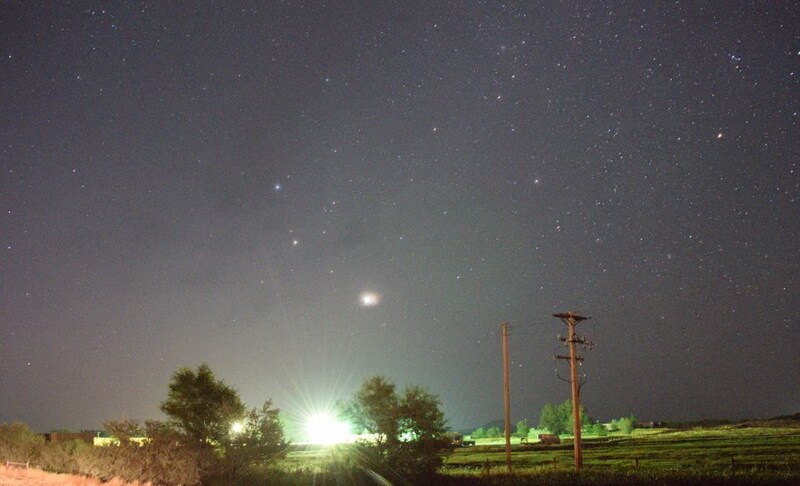 I wish I could accompany them with stargazing, but without proper equipment it was worthless. I had only Nikkor 18-55mm f3.5-5.6, that wasn’t perfect for the night-time pictures. I was considering to carry out the dawn observation, especially astronomical one. Bearing in mind that my batteries have to last throughout the eclipse period I refused this idea and went sleep to the car eventually. The beautiful sunrise woke me up. As time flew our parking bay tended to be full before 7am. Everyone was worried about the cloudiness because a high-altitude clouds appeared on the sky. Due to lack the Internet connection we couldn’t get the most actual cloudiness forecast. Pic. 7 Sunrise, but not as beautiful as it could be due to irritating cirrostratus clouds, 6:39 UTC-7. Pic. 8 Our parking bay was almost full around 7am. 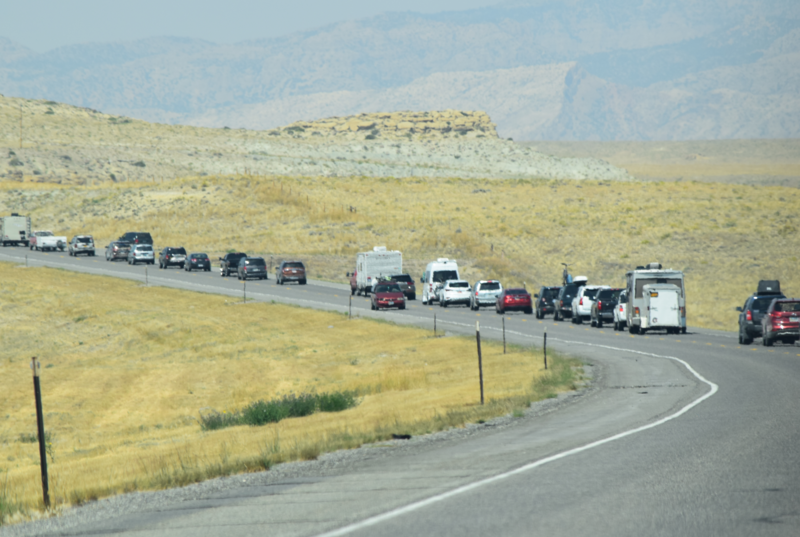 Traffic on U.S. Hwy 26 was increasing rapidly. We didn’t want to move, because our equipment was already prepared. In another situation was our 2nd team, that approached around 7.45 am to us. Pic. 9 View on the Lost Wells Butte 1734 m.a.s.l from the U.S. Hwy 26. 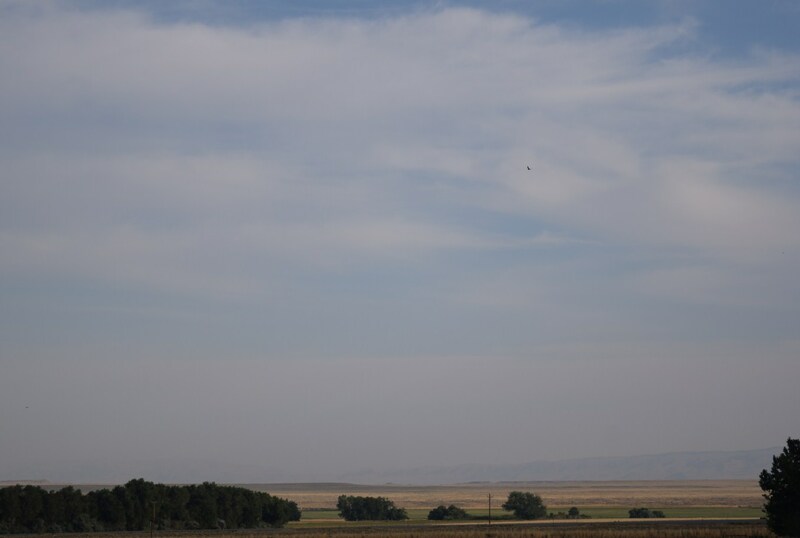 The Wind River Range was not visible due to haziness. Altostratus and cirrostratus clouds were prevailent during morning hours. Pic. 10 Unlike to Wind River Range, the Owl creek Mountains were pretty good visible on the morning. Pic. 11 A mileage road sign on the opposite side of our parking bay. 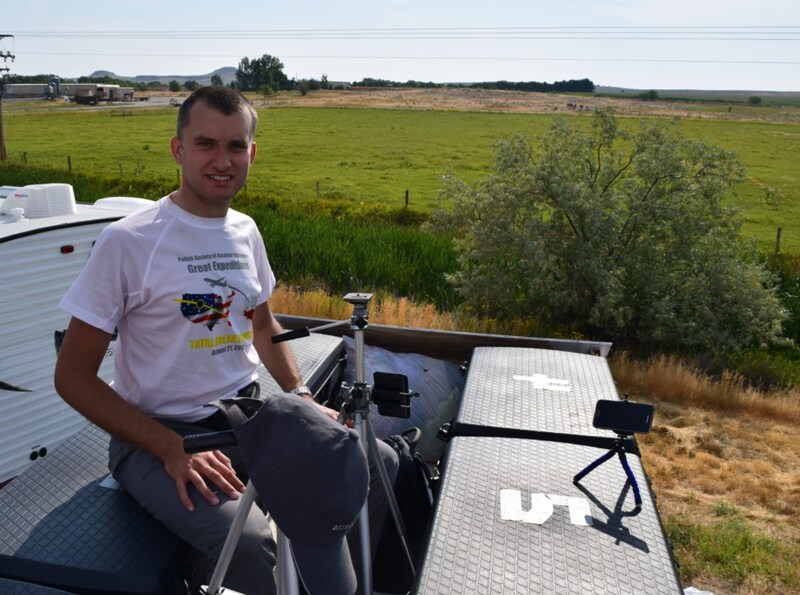 After quick consultation our team lead Marek Substyk decided to go further to Soshoni and next eastwards in order to lose these irritating clouds. 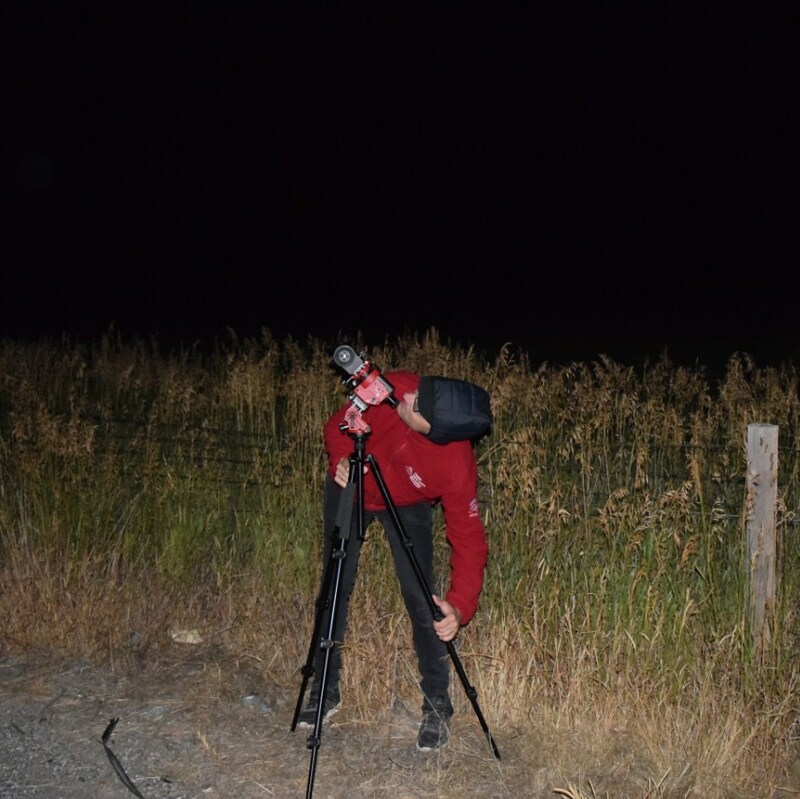 We couldn’t really go with him, because mates had the equipment unfolded and packing it, then unfolding again could take too much time to get it done before the eclipse. Besides Bartosz Wojczyński had a really huge equipment, too huge to move it easily. He had a really ambitious plan, because he wanted to repeat the Eddington’s 1919 experiment – the test of general relativity. Finally we have got to conclusion, that staying here will be better for us. Since that time our 2 teams were splitted and watched the eclipse separately. 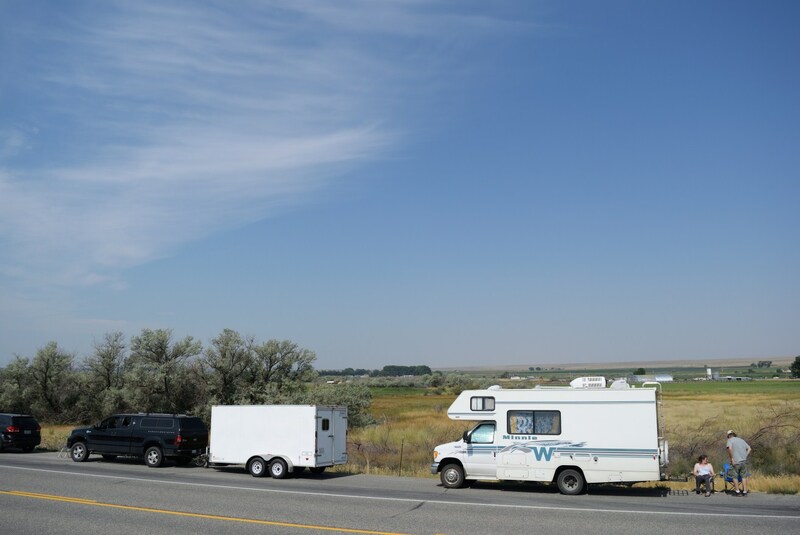 Our another team was located finally on the Waltman Rest Area frontyard near Powder River. Pic. 12 The members of Polish Society of Amateur Astronomers thinking about a right place to eclipse observation. Pic. 13 Suspicious cloudiness, because weather forecast from last evening was showing a clear sky over Wyoming. 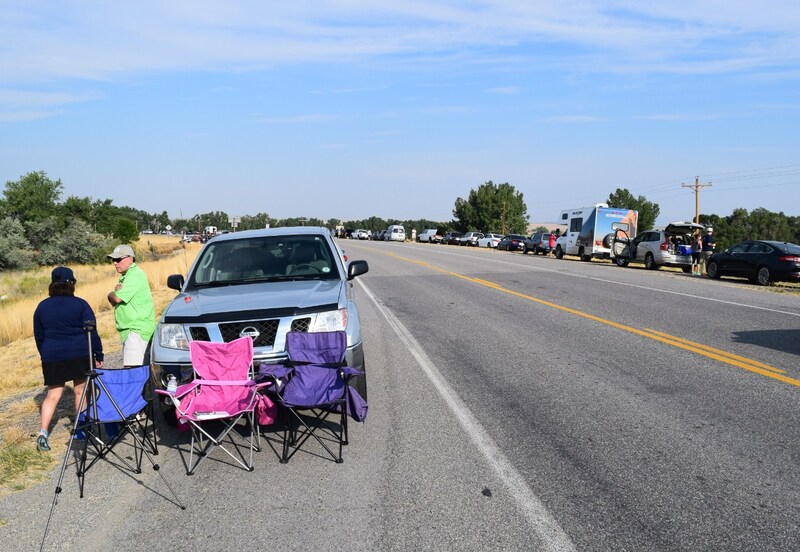 For entire morning new observers were arriving filling up all parking bays and every possible free spaces on the edges of the U.S. Hwy 26. 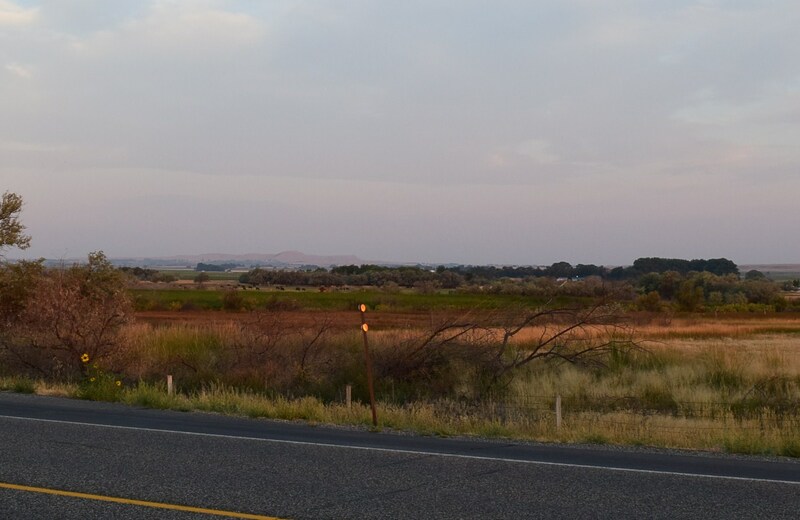 My earlier investigations were leading to set optional observation venue with view especially towards west, where I was able to see the Lost Wells Butte. Pic. 14 – 16 The U.S. Hwy 26 getting busy and occupied around 10 am. Unfortunately around 10 am the opposite side of the road was full of cars, hence I couldn’t see the horizon. 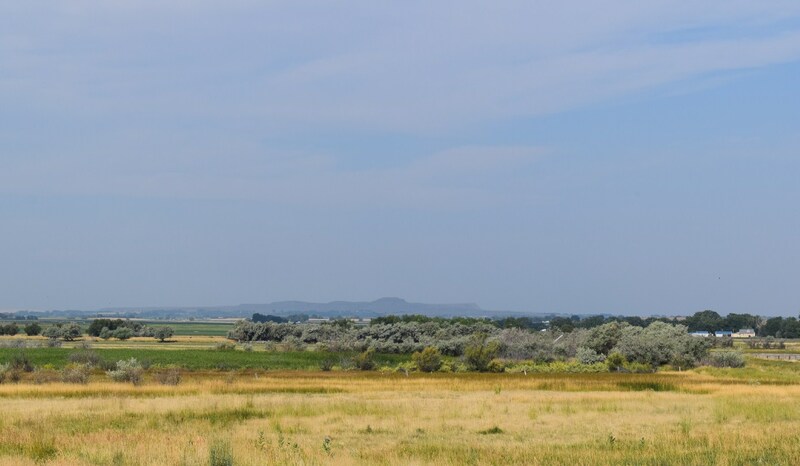 I was trying to find the venue also in adjacent Missouri Valley Road, but also there it was impossible due to high trees over the horizon and also foreshorted view on the Owl Creek Mts range. Pic. 17 All free spaces alongside the Missouri Valley Road were also in use. My inconvenient problem solved people from catholic pilgrimage, who led me to use the top of their van. I have been grateful them for today. Thankfully from the top of their car I could see the north western horizon clearly. 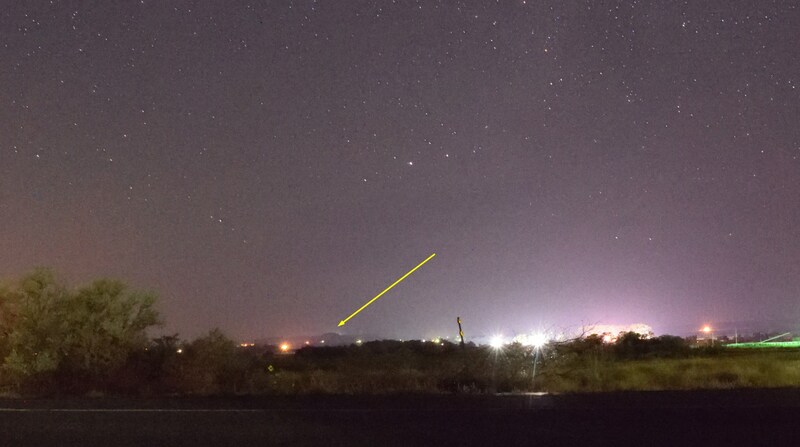 Unfortunately I still couldn’t see the western part of the horizon with Lost Wells Butte, where the 2nd contact should be visible 16 sec earlier. Never mind. The most important was the north-western part of the horizon, from where lunar shadow should approach (shadow-in). 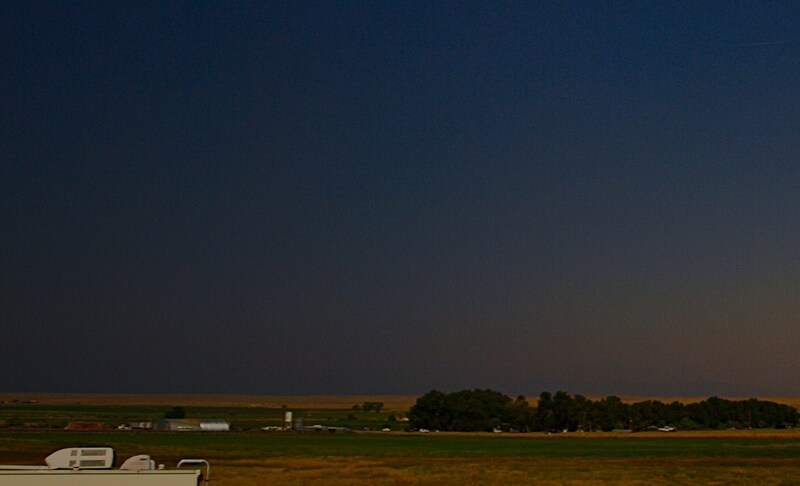 The opposite horizon was clearly visible, however the buttes were to close to spot the difference in moments of umbral contact. Pic. 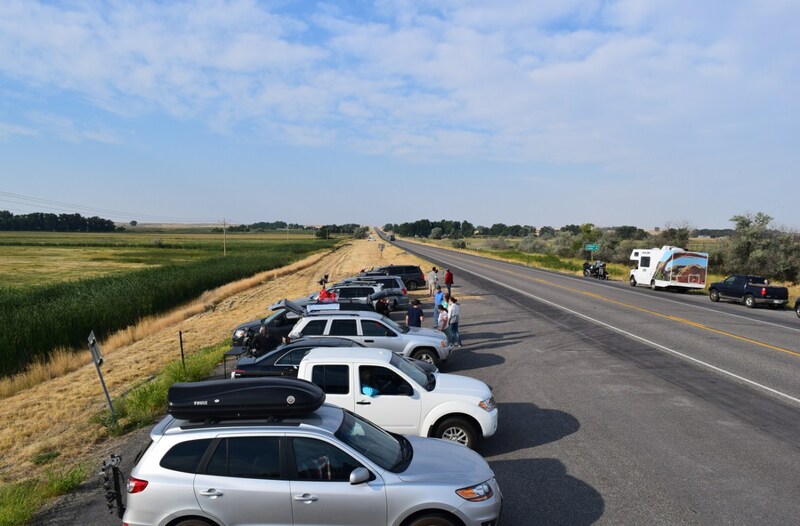 18 View from the pilgrimage van on the U.S. Hwy no 26 and my team members between the cars. Pic. 19 View towards north-west (shadow-in direction). Unlike to previous days, when we were travelling through the mountains the eclipse day was hazy. I didn’t realize, that the effect of totality impact on haze will be clearly noticeable. The details of this as well as whole observation of total solar eclipse will be described in further articles. Pic. 20 Lost Wells Butte located 16 km ahead was veiled by haze. Wind River Range around 90 km further remained invisible. Pic. 21 The Owl Creek Mts in around 30 km distance was poorly visible. Being on the van I had a dozen or so minutes to set my equipment. I installed 2 smartphones to measure the illumination changes during the eclipse and footage records. Next I prepared my 2 cameras (1 DSLR Olympus A510 and compact Canon Powershot SX 130 IS) in order to observation the lunar shadow movement both across the western sky and the Owl Creek Mts and another DSLR camera Nikon D5300 with 2 lenses where 1 – Nikkor 18-55 was designated to capture the lunar shadow movement on the eastern and south eastern sky (shadow-out) and Nikkor 55-300 mm to capture the solar corona outside the totality and Sun for entire eclipse period. Pic. 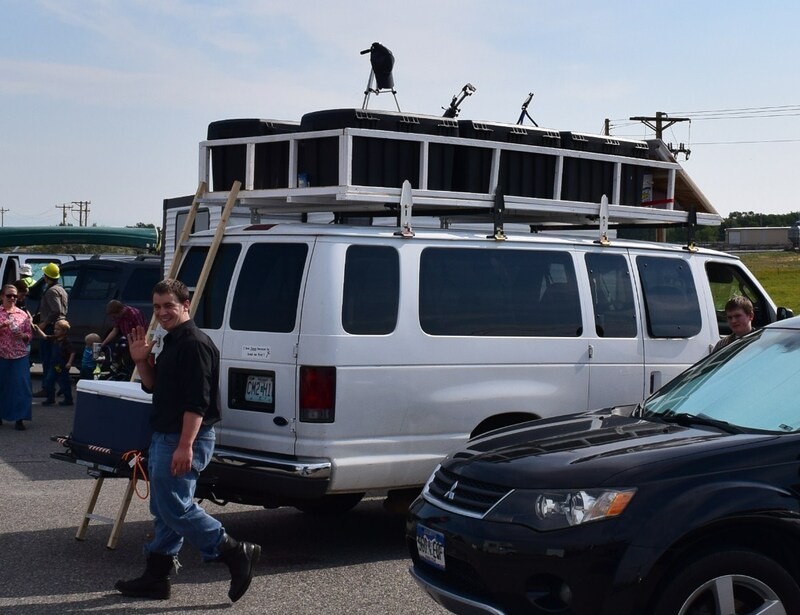 22 The pilgrimage van with my (yet not completed) gear on the top. Pic. 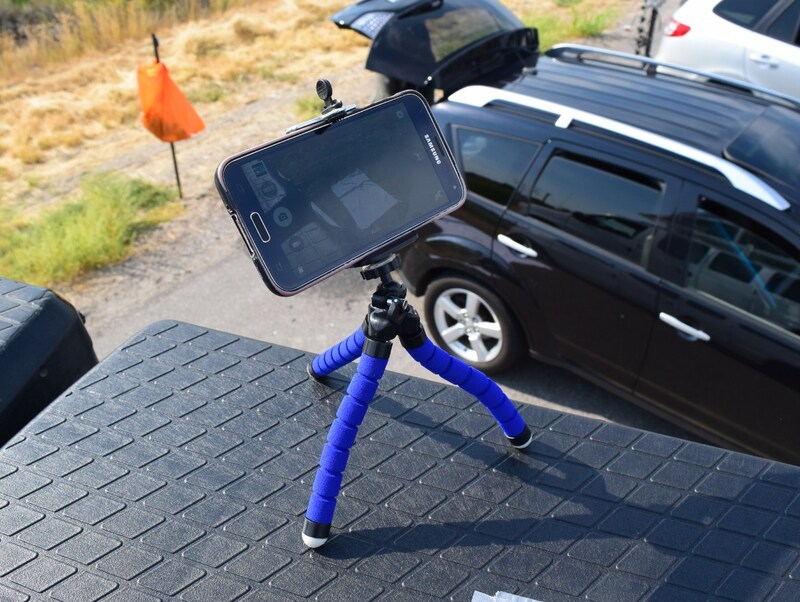 23 One of my multifunctional smartphone, which was measuring the light level for almost entire eclipse period and chased the shadow bands on the wtihe sheet under the car (seen in the screen). Pic. 24 Preparing my gear and observation place. I had a bad luck with one tripod, that got defect and became not useful. This situation made my observation more difficult. On top of that I was quite far from rest of my team, that made me out of grid for the eclipse time being. Pic. 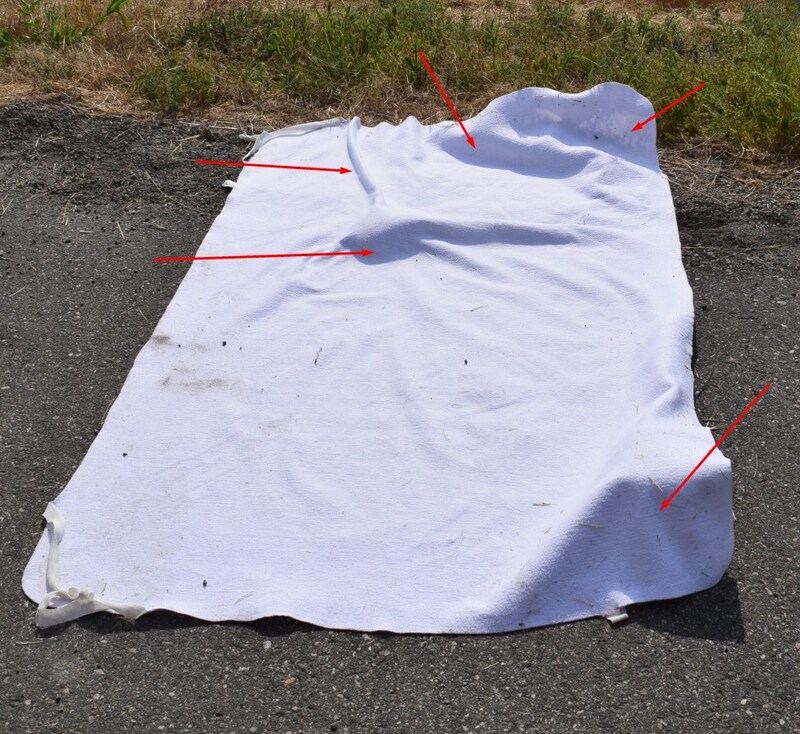 25 My sheet exposed as much as adequately for totality observations. Pic. 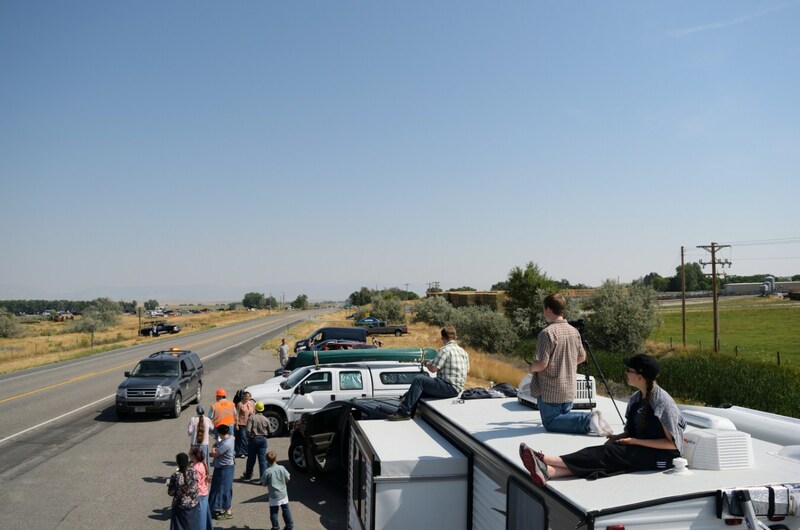 26 Easy way to record the sunlight reflection around the totality was a van top white deck. Unfortunately I was run out of time to make it properly. 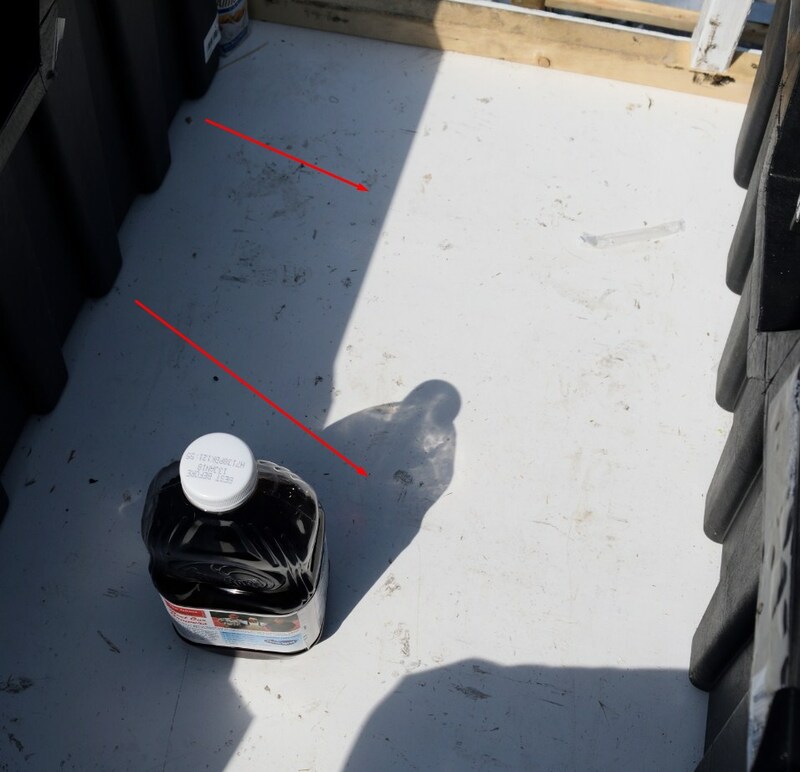 Red arrows shows the shadow edges, that appeared to dissapear around 1 second before totality. Purportedly a solar corona could cast some shadow. Hopefully this kind of observation will be feasible over the next totality. The eclipse started before 10:20 am. Earlier I shouted to everyone: “One minute!”. Shortly after 1st contact some guy from local radio visited me and asked about me and my observation. I shown and explained to him what I would like to see during this eclipse. Watching the shadow fleeting above the mountains was interesting for him. After the interview with this guy a members of my team: Karol Kucharski and Kinga Mroziewicz visited me. 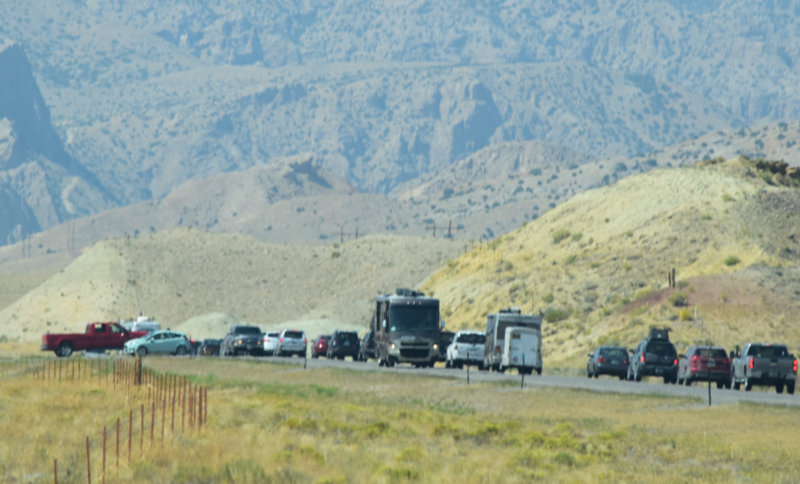 As I said before, my observation venue on the van was a few cars ahead from our cars. Therefore I couldn’t contact with my colleagues directly. Pic. 28 The eclipsed Sun was veiled by corrostratus clouds from time to time. Presence of these clouds were reflected on light measurements too, 300mm, 1/125s, f/5.6 ISO 100, Baader 5.0. I felt, that whole partial phase passed very quickly. It was strange, because this one and half hour should last a bit longer I think. For this time the traffic on U.S Hwy 26 increased. 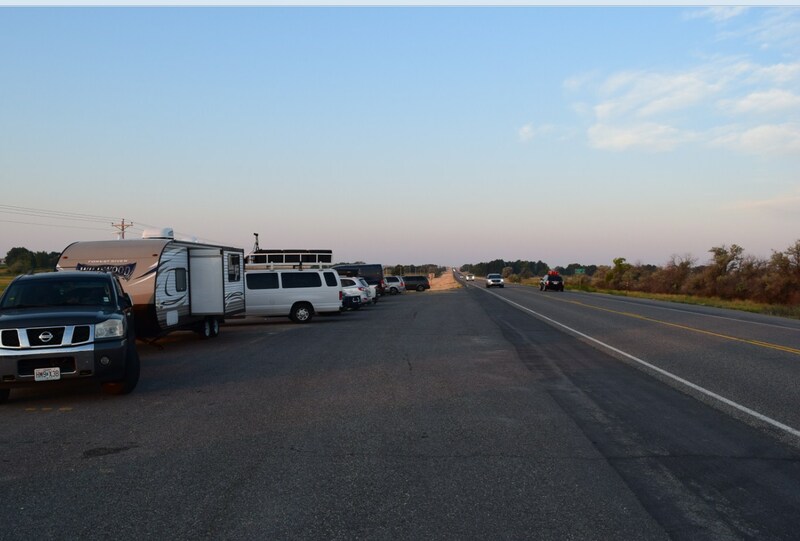 People occupied all possible free space alongside the road and exposed all their equipment needed. Pic. 29 Crowded parking bay next to the U.S. Hwy 26. I was watching the Sun and everything around. When Moon gradually moved down across the solar disk the cirrus and cirrostratus clouds moved southward and gave way to the clear sky around Sun. 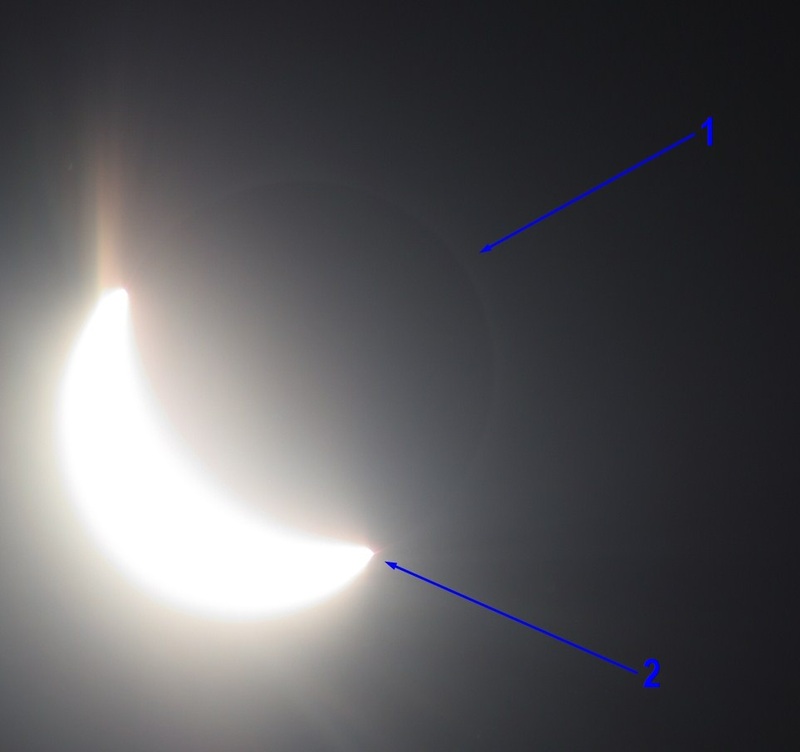 Before it a nice halo was visible (and perfectly captured on Bartosz Wojczynski’s photos of partial phase). Around 10 min before 2nd contact I felt cool wind. Looking on Sun by naked eye I could spot a gleaming crescent. Pic. 30 Partiality in around 90% obscuration, when a cold wind started to blow; 300mm, 1/640s, f/5.6 ISO 100, Baader 5.0. Situation was strained for me, because I had to manage a few things at once. 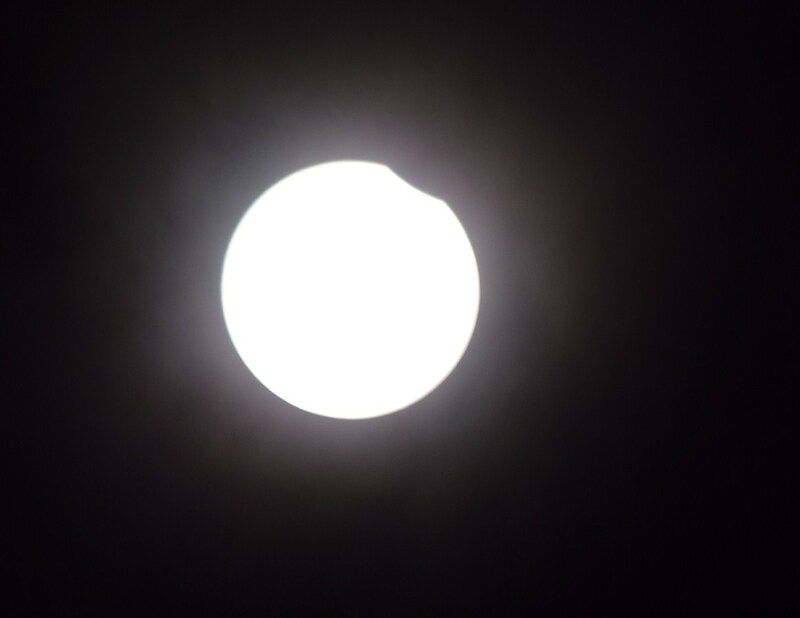 The most important were 5 minutes before totality, when solar corona became visible in long lens. I used the light-fall option to capture it more safely. Moreover I had to focus on the approaching lunar shadow, that started to be seen on western horizon. 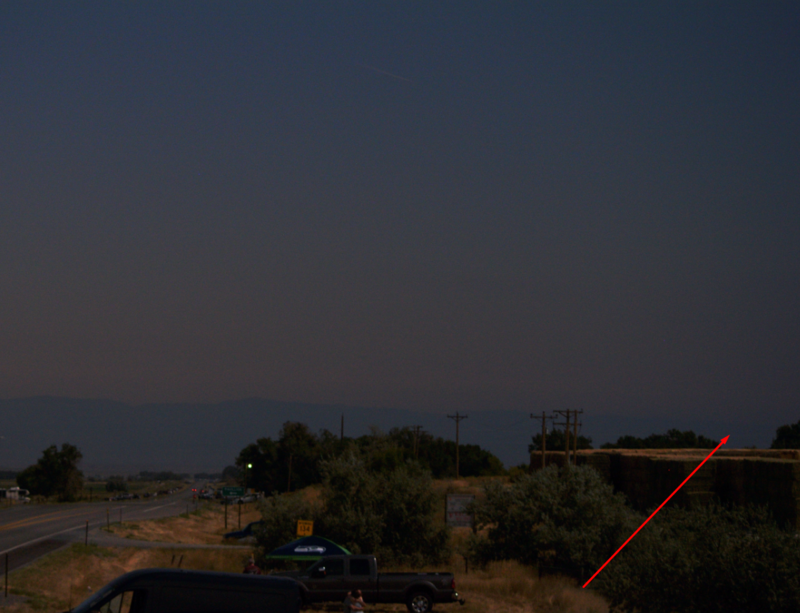 Just before the totality I took a few photos of the shadow approaching on the Owl Creek Mts. Thereafter I attended to snap a photo series of baily’s beds and 2nd contact. Suddenly the sky and surrounding darkened. 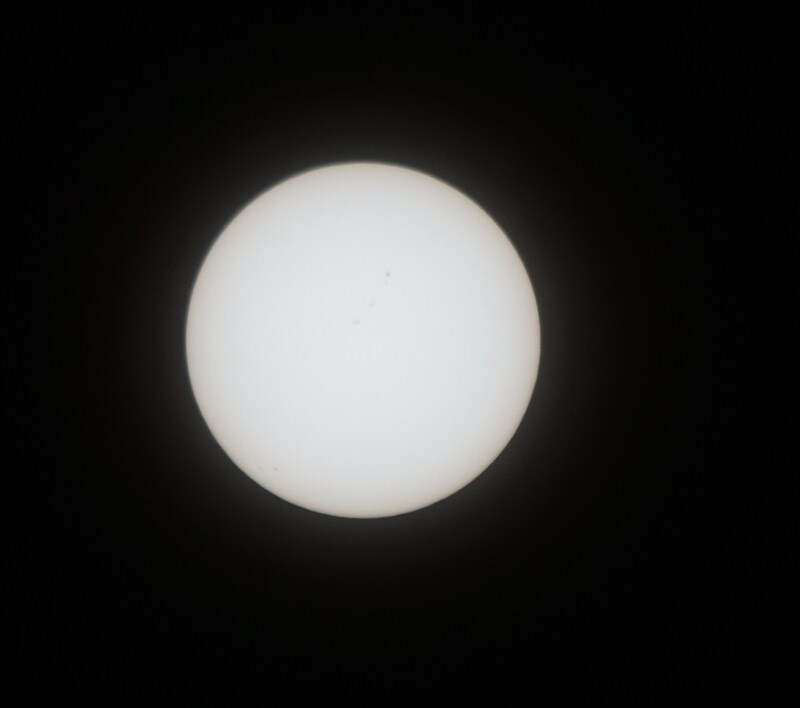 I had fractionally more than 2 minutes to cover whole horizon and capture the eclipsed Sun. Watching it by naked eye Sun appeared to be bigger than normally. It was the effect of corona, which surrounded the black lunar disk. Watching the totality through the Nikkor 55-300 mm was also a nice experience. 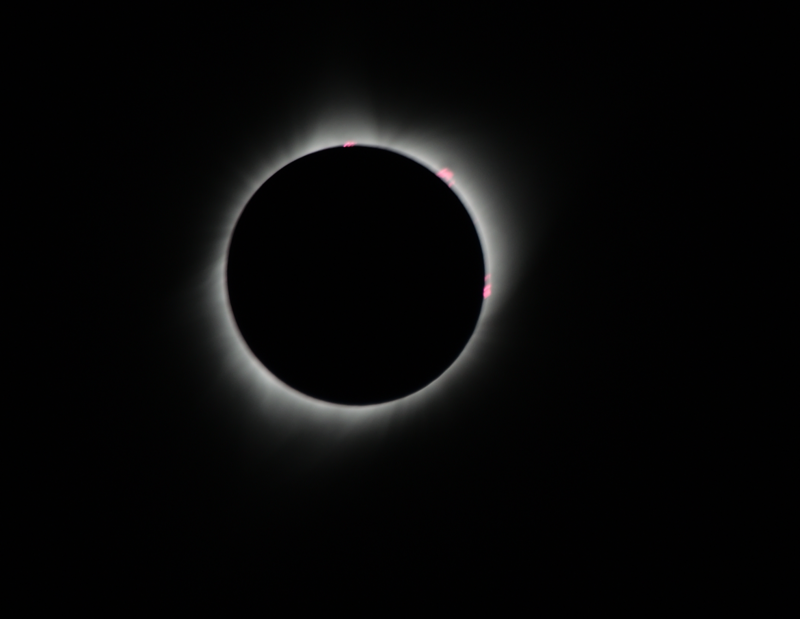 I could see the pinkish prominences, that I had no ocassion to see by naked eye. Possibly I could spot some, but I had no enough time to do this. I spend around 2/3 of totality watching the Sun and another 1/3 for surroundings, taking a lot of pictures in the meantime. Because the view through the Nikkor 55-300mm was like view through a pretty good binoculars I had quite detailed view on the totality phenomena. Pic. 31, 32 Approaching lunar shadow from the north west (shadow-in): 31 – 4 min totality (96%), 32 – 30s before totality (99,4%). Pic. 32 Solar corona seen outside the totality, 3m10s before totality (96,5%): 1 – corona ring, 2 – prominences; 300mm, 1/4000s; f/5.6, ISO 100, cropped. Pic. 33 Lunar shadow hitting the Owl Creek Mts. Pic. 34 Just few seconds before totality! ; 300mm, 1/2000s, f/5.6, ISO 100. Pic. 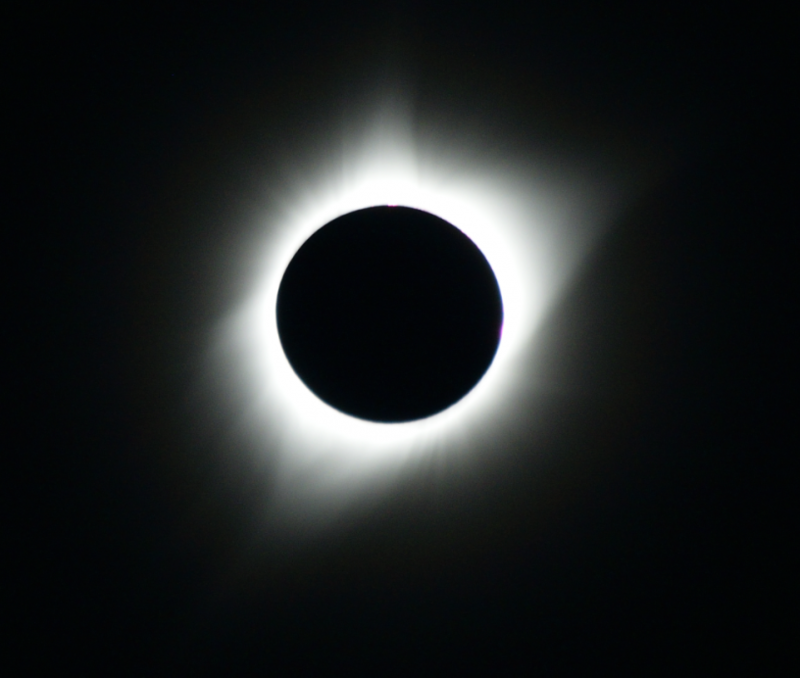 35 – 37 First totality in my life! 300mm, 1/125 to 1/250s f/5.6, ISO 100. Pic. 37 2 steps of EV adjustments in order to emphasize the solar corona. Pic. 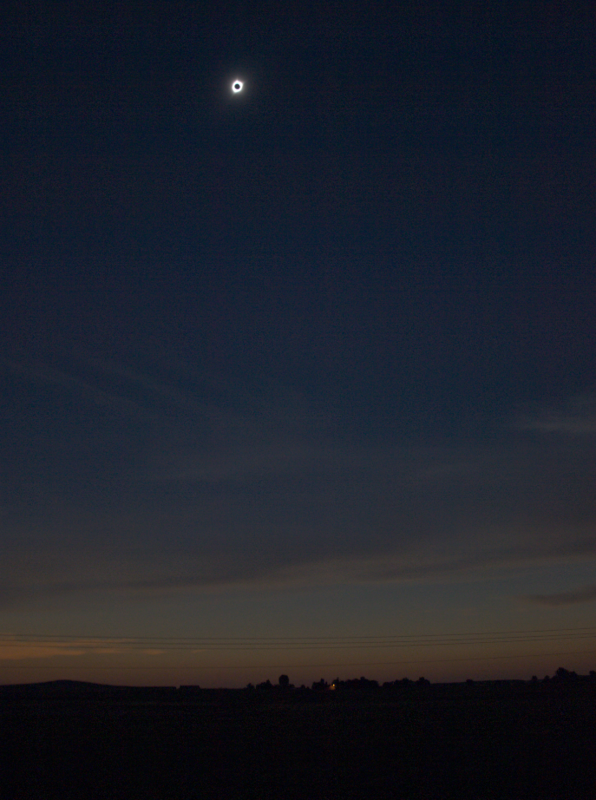 38 General view of the totality towards SE; 14mm, 1/25s, f/3.5, ISO 100. Pic. 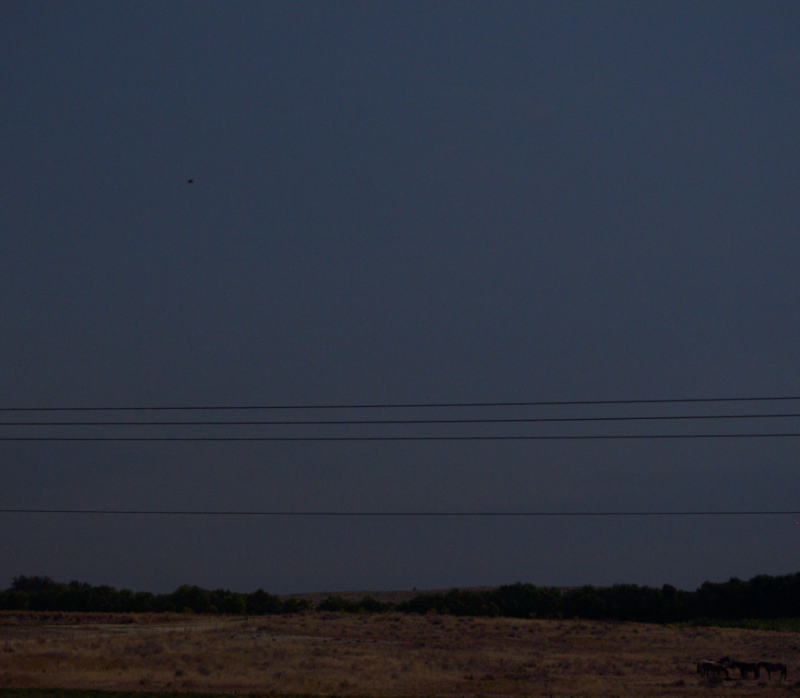 39 The Owl Creek Mts during the totality; 14mm, 1/25s, f/3.5, ISO 100. Suddenly I spot the brightening Owl Creek Mts range far beyond and took a few pictures immediately. Fortunately I catched the fleeting shadow, leaving the mountains quickly one by one. I was probably the one observer, who was looking towards opposite part of the Sun before 3rd contact. Some my colleagues noticed it. The observation of the umbral movement through Owl Creek Mts was sufficient and carried out as planned. Around 3rd contact I was torn between the mountains and the Sun. Holding my camera and changing the settings as quick as possible I wanted to collect as much as possible. Finally I took a few photos of the Sun around 3rd contact and the mountains on the opposite side too. Pic. 40 Lunar shadow receeding from the Owl Creek Mts. Red arrows shows the fuzzy shadow edge; 135mm, 1/10s, f/4.5, ISO 200. Pic. 41 Umbra on Owl Creek Mts seen from arleady illuminated position. 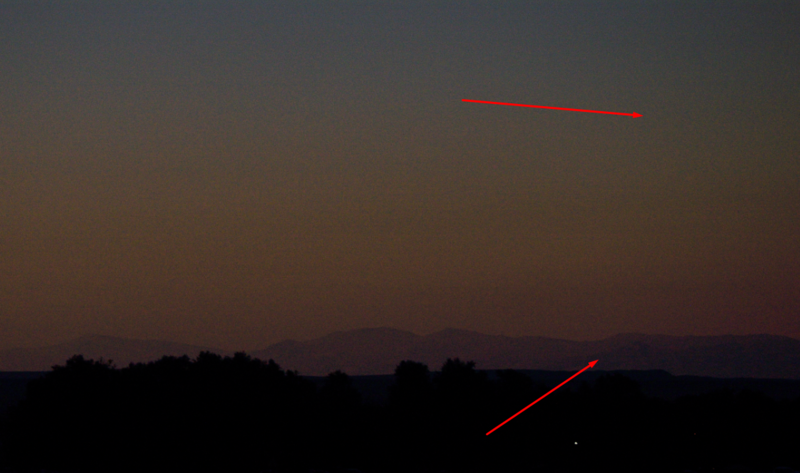 The mountain range appears to be merged with shadow cone (red arrow); 135mm, 1/25s, f/5.6, ISO 100. In the result of the lunar shadow movement observation I can now distinguish a 4 cases of lunar shadow presence in the mountainous landscape. It will be also described in the future. I thought, that mountainuous landscape response during the totality is more important for me than Sun itself because Sun is going to be observed by everyone unlike to rest part of this whole natural phenomenon and no one will waste the precious tens seconds to watching darkening or brightening mountains. I did it on my own eyes! However additional footages was desirable later due to lack of automatization. 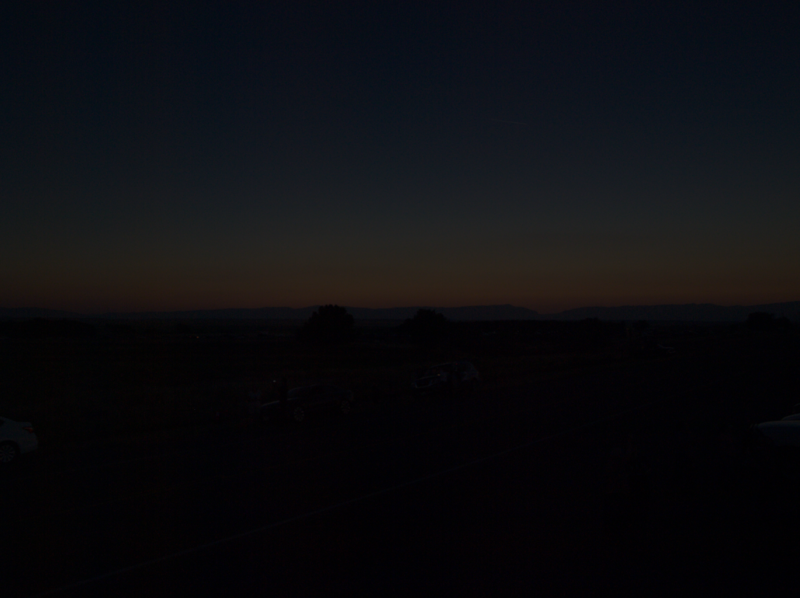 My admiring of the landscape during the totality was too short, because it was my first time inside the umbra. Hence I was going to watch the Sun with all details, but for not the entire eclipse like everyone. Once 3rd contact occurred I headed my camera immediately on east direction (shadow-out) where I could spot receeding shadow as a grey infinity. It dissapeared after few seconds. Right after this I attended to observe solar corona outside the totality again. Pic. 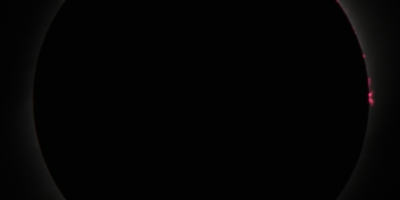 42 Incredible view of the dark umbra cone. You can see standinghorses on the right bottom and also shaded clouds on the eclipsed sky beyond; 70mm, 1/25s, f/5.6, ISO 100. 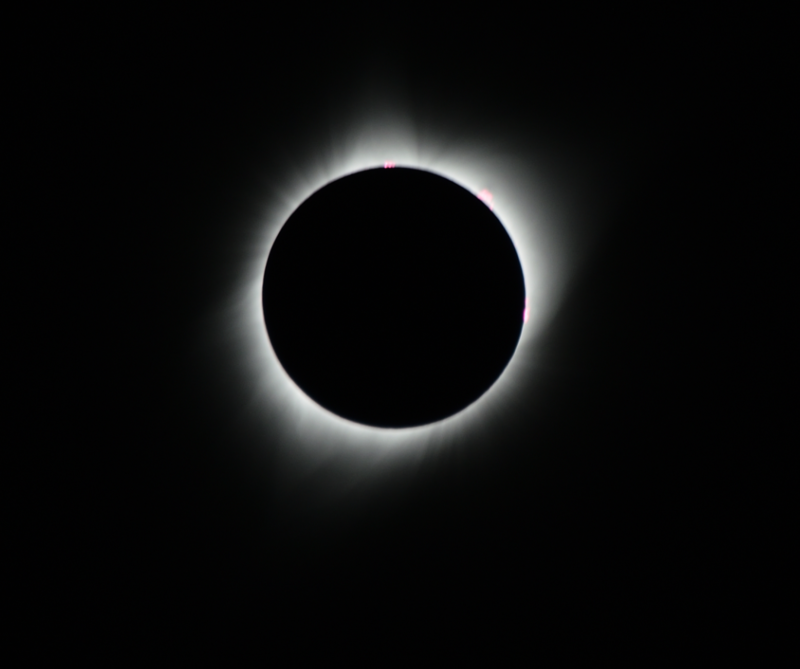 If I could summarize my observation of the totality I can assess, that I spent around 30 sec watching the Sun by naked eye, around 1 min watching the Sun through long lens and another 50 sec admiring the landscape during the totality. 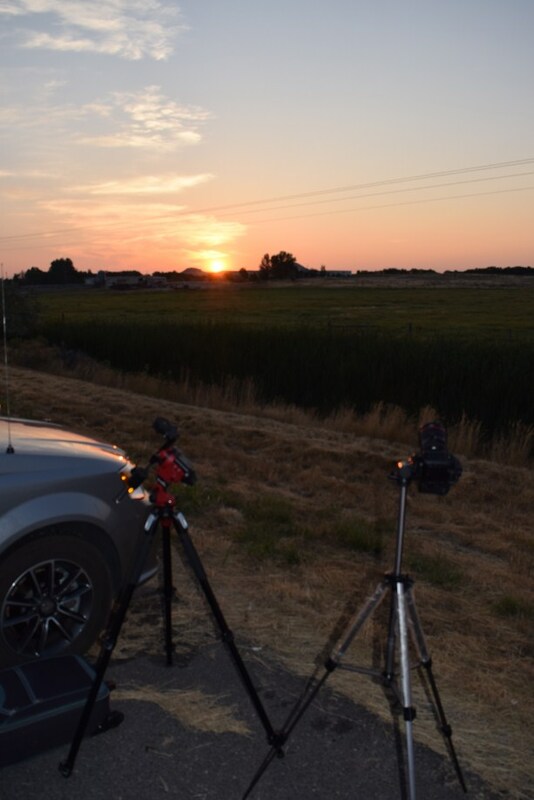 In the meantime my 2 smartphones were recording the luminosity changes and footages of white sheets in order to chase the shadow bands and ground darkening circumstances. I didn’t spot shadow bands but I noticed another interesting phenomena, that I am going to describe later. I didn’t spot the nature behaviour also, as later we have been informed about. Bartosz Wojczynski noticed, that the horses were standing still during entire totality. These horses pastured next to the road, maybe 50 m ahead. Except the totality I clearly saw the Baily’s beds during the 2nd contact. 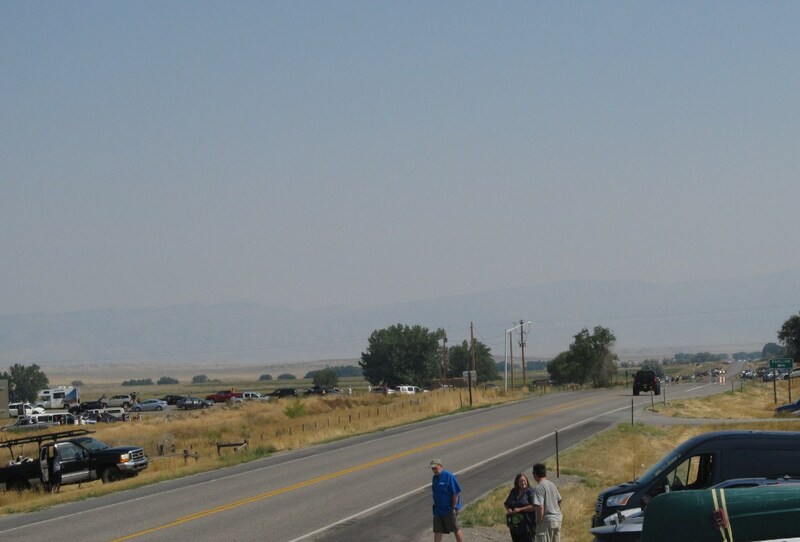 During the totality only 1 car passed the road no 25. The most funny moment was just after the 3rd contact one car left our observation place. It was less than minute from the totality! 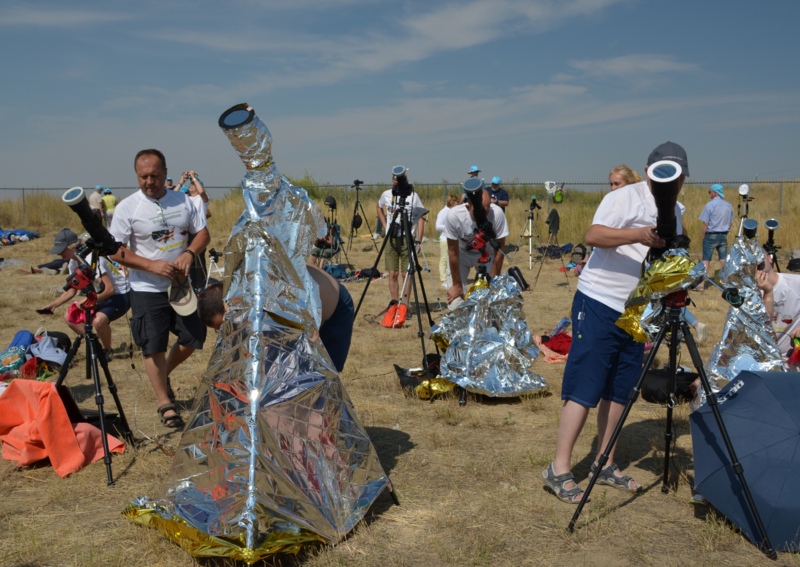 In the meantime our 2nd group was watching the eclipse around 90km eastwards, outspeaking around shadow cone ahead. Pic. 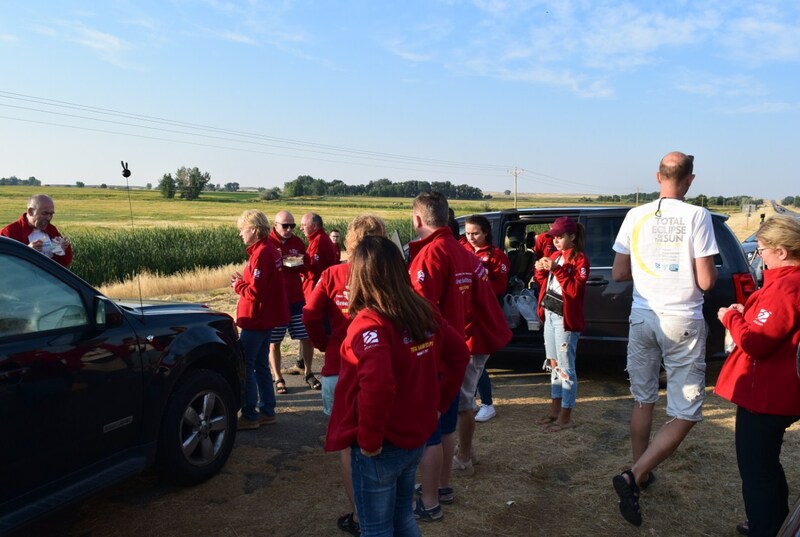 43 Last checking of the equipment before totality (crtedits: Piotr Chabior). Everyone was excited the maximum phase of the eclipse. Pic. 44 A group photo of the members of the Great Expedition of Polish Association of Amateur Astronomers (PTMA) (credits: Marek Substyk). We were curious how did they fared, but we had to wait until everyone reach our place to stay, because it was hard to share our all excitement through the phone. 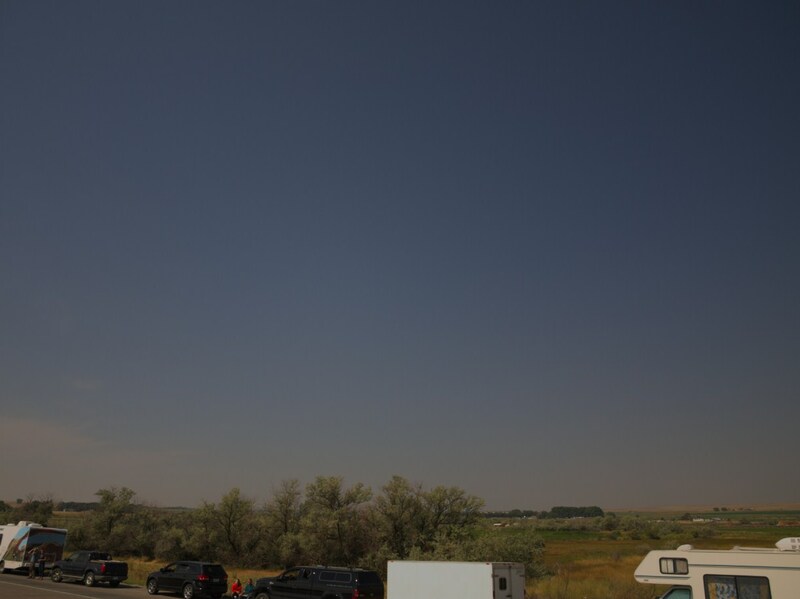 Fortunately both in our place and where our 2nd team was, the sky was free of cloud at the time of totality. Our whole team was successful! I carried out my light measurements and some photo sequences after 3rd contact for about next 25 minutes. The pilgrimage started to pack their gear and wanted me to leave their van. My light measurement terminated when obsscuration around 60%. 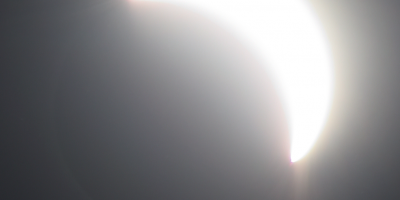 I joined my colleagues and still took a pictures of partially eclipsed Sun up to the last 4th contact. 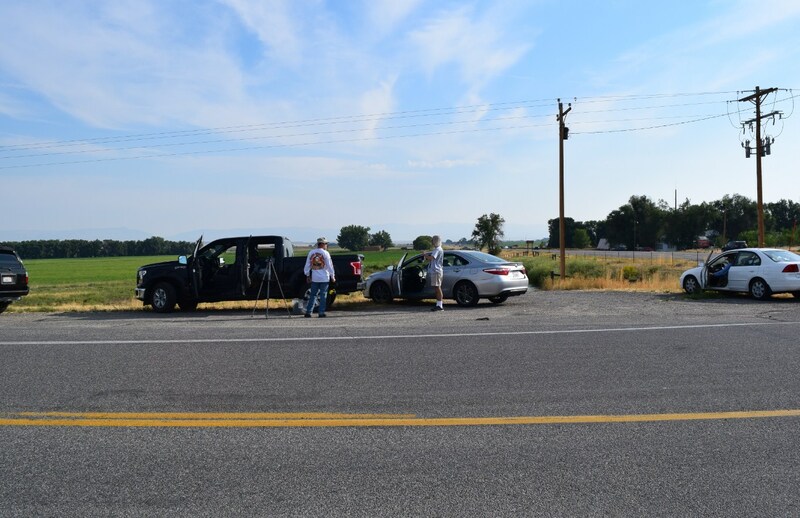 They said about the clerk from Riverton who invited us to local museum, where the photos of the 1918 totality in Riverton has been collected. Some of my colleagues observed the Sun also till 4th contact, because they used Eclipse Orchestrator software and didn’t want to stop. To be honest this first total solar eclipse triggered many emotions inside me. After 3rd contact, when obscuration was lower than 90%, making all noticeable things gone I started feel sick. I was very tired and had a headache. All my eclipse emotions went down immediately. In general all emotions went down. We can only share our new eclipse experiences. Everyone was excited and happy. The time to pack our equipment came, because after 4th contact was nothing to do. Besides the traffic was gradually increased as the carriageway edges and parking bays became more and more empty. 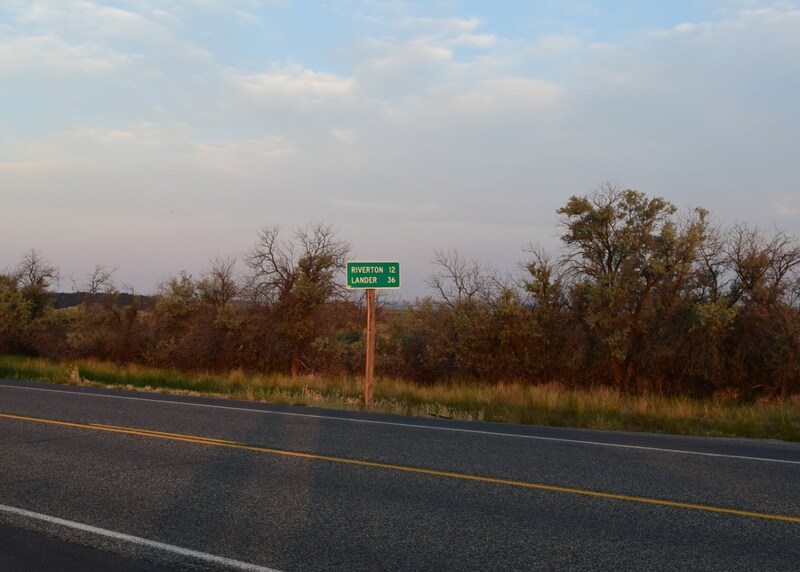 Our final destination that day was Cody, a small settlement located just behind the Owl Creek Mts. The journey there should last no more than 2 hours in normal conditions, however the eclipse phenomena incurred a terrible traffic. It was assessed that Wyming, a big state with only 500k inhabitants could host even 2m people in eclipse day. It was a main subject of our wonders next to possibly bad weather, that in this place happens only rarely in august. Possibly it will be also the subject of further articles in my blog. Pic. 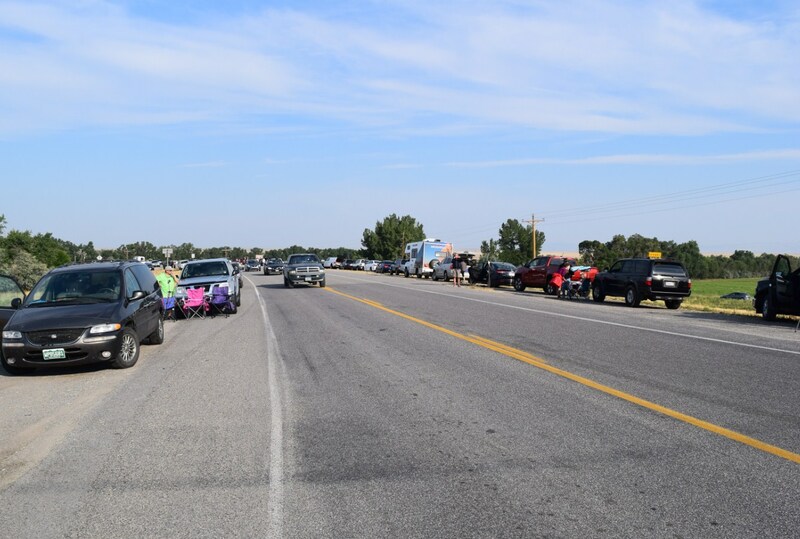 45, 46 Congested U.S Hwy 20. Fortunately on the way up there was not traffic issues because we were travelling before dawn break. 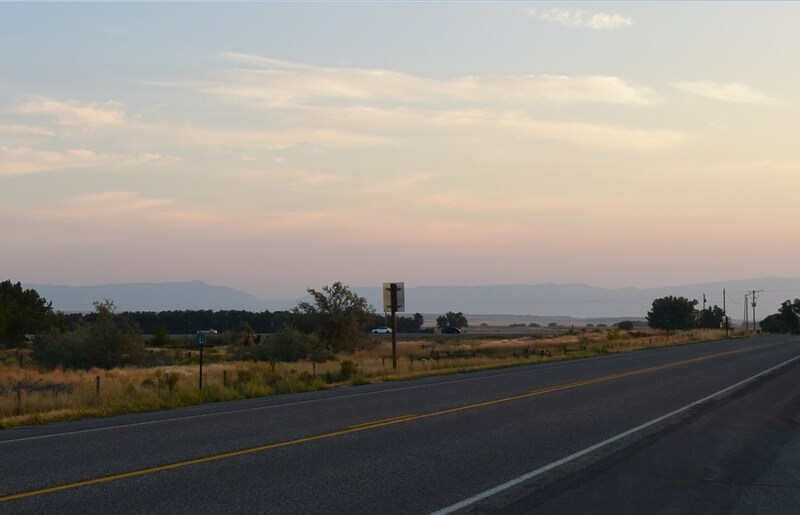 On the contrary of our night journey the driving towards Cody was terrible, especially in Soshoni area, where the U.S. Hwy 26 coincides with U.S Hwy 20. It was not easy to leave the Soshoni. From Idaho Street to Boneville Rd just behind the river we were literally inching meter by meter. There were tens cars ahead and behind us. As our way progressed the traffic decreased. Some people decided to diverse this road using aforementioned Boneville Road another drivers went quicker. Anyway at the stage of Boysen Reservoir Dam the road was clear again. Pic. 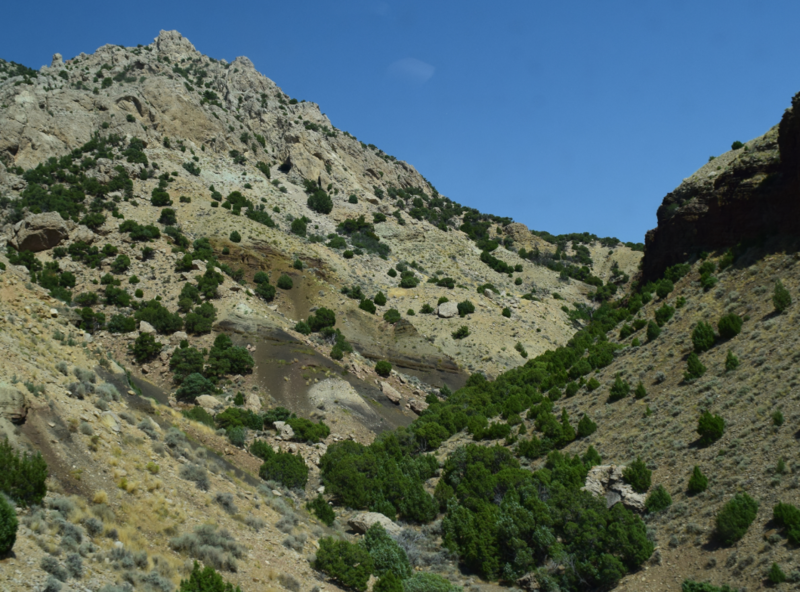 47 Typical landscape of the Owl Creek Mts range with many beautiful vistas on the time of Great American Eclipse. We approached Cody around 4:30 pm. 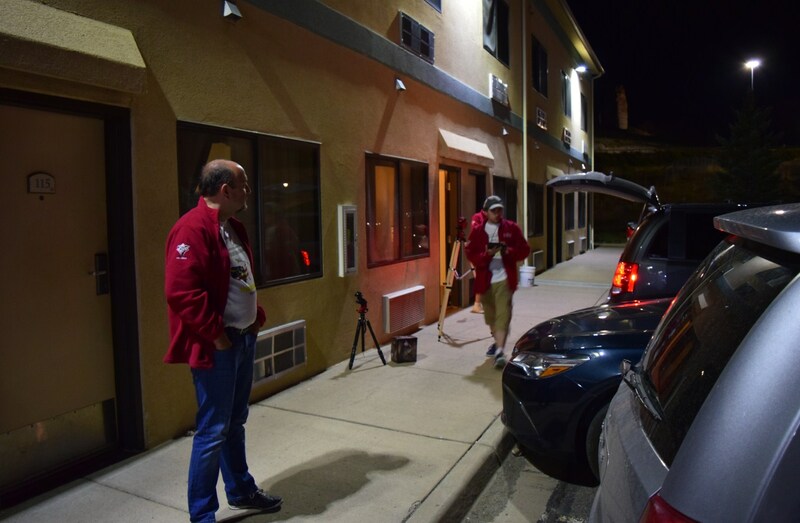 All members of Great American Expedition of Polish Society of Amateur Astronomers reached Cody before 7pm. We spent the evening on enjoying our memories and some pictures from the totality. It was a really nice and difficult day but we made it! Pic. 48 A brief summary of my Greatest American Eclipse observation. Click to enlarge or see an original image here. I am very happy, that finally I reached my goal, saw the totality, was inside the umbra and made a valuable investigations about the atmospheric response during the totality. I say again, that everything is going to be presented in the future. There is a lot of issues associated with this spectacular phenomena, that should be escalated, but is constantly being ommitted. Hopefully along with technical development anyone is getting more and more able to cover the eclipse phenomenon holistically. I am one of the person, who can help to discover all mysteries of this celestial event. Personally for me it was a second solar eclipse expedition. Read more about the first one to Scotland. Total solar eclipse vizualisation on Google Earth. 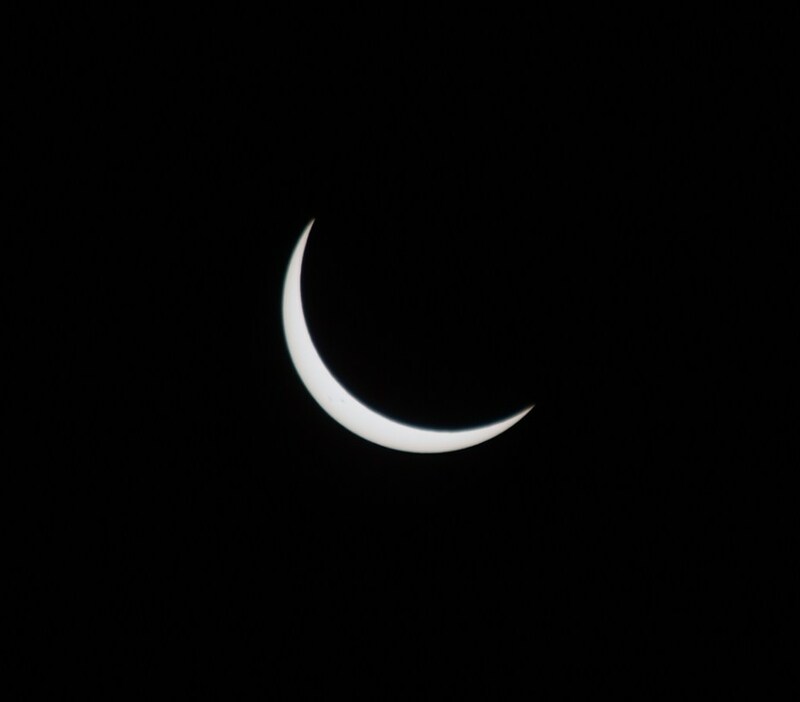 Deep partial solar eclipse in Scotland.